Next man up has kinda been the theme of this young football season for our Louisville Cardinals. Guys stepping up on the offense and defensive side of the ball when called on. You might feel like this Louisville team is struggling and in some aspects they are. But the young guys on this football team are flourishing. With 129 yards rushing in the last game Malik Cunningham had one of the highest single-game rushing totals ever by a Louisville QB. In his first career start at linebacker, Robert Hicks led the Cardinals in tackles with 11 against WKU. He is the first Cardinal to do that since Dorian Ethridge last season. While freshman defensive end Jarrett Jackson had three tackles and the game-winning sack. He showed a lot of promise for a second straight week. When these young Cardinals ran off the field last Saturday night they carried a lot of enthusiasm into the locker room. Even tho it was only a win over Western Kentucky they appeared to have some of that swagger back I had seen glimpses of on the field in Orlando. It’s going to take another big effort from these young guys on Saturday afternoon in Charlottesville. The Cardinals open up their 5th season against a Virginia team that is currently 2-1 as well, with a loss to Indiana 20-16 sandwiched in between wins over Richmond 42-13 and Ohio 45-31. In that Ohio game, Virginia QB Bryce Perkins had a solid outing with 379 yards and three scores, while Jordan Ellis posted three more scores and 171 yards on the ground. Olamide Zaccheaus went off for 247 yards and two TDs to lead the Cavs in receiving. The Virginia offense has another dimension to it this season with the ability of Perkins to make plays with his legs. But make no mistake about it this guy can also do some damage with his arm. Louisville 85th in total defense, 94th in rushing defense and 56th in passing defense will have a special challenge ahead of them in week four. They need to be aggressive enough to keep this offense in front of them but not be too aggressive overrunning their coverage. If Louisville can keep Perkins in check on the ground, and CBs Rodjay Burns and P.J. Mbanasor both very fast and talented can keep this defense from getting beat on the outside I really like our chances. Virginia is 13th nationally in converting third downs. The Louisville defense has to get off the field on Saturday. The mobile QB has been the Virginia Defense Kryptonite. 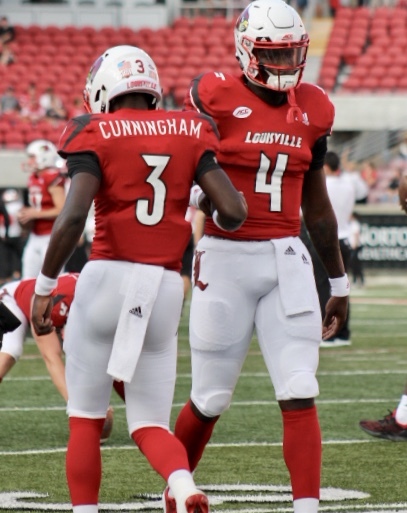 And with a steady dose of Cunningham and Dae Williams I think this Louisville team will find the end zone a few times. And I’d like to see our WR’s come to life this week as I think they could pose a real challenge for the Virginia secondary. Virginia Coach Bronco Mendenhall said after their game against Ohio last week: “Our secondary is not playing consistently, but Bryce [Hall] and Darrius Bratton are,” “Our safety play is inconsistent. Our corner play is actually consistent.” If Cunningham and Williams can establish the run and force the Virginia secondary up into tight coverage I really like our chances of beating them with the deep ball. Dez Fitzpatrick, Seth Dawkins, sand Jaylen Smith can sure talk a mean game. Now its time to play one. This entry was posted in BEAK FOOTBALL PREVIEW, Uncategorized by ru4uofl. Bookmark the permalink.